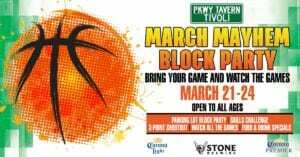 Bring your game and watch the games at our March Mayhem Block Party on March 21-24 at PKWY Tavern inside Tivoli Village Las Vegas! This event is open to ALL AGES! Watch all the college basketball tournament action and enjoy great drink/food specials! Test your skills with various games including 3-point shootout!